In the past I’ve spoken about moving our collections Beyond the search box, the colorful library and that libraries should be the provider of digital information but not control how we interact with that information. 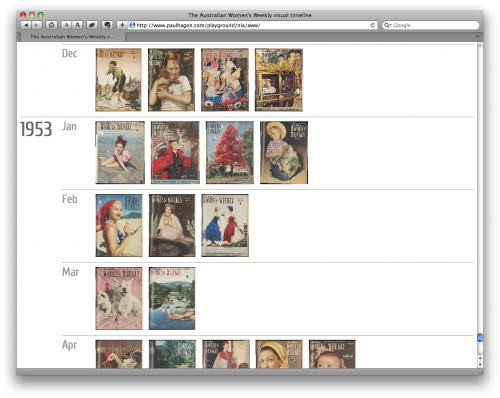 Recently the National Library of Australia released digitized versions of the Australian Women’s Weekly. The existing way of accessing this collection is via a search box or a calendar. That’s a pretty traditional method for accessing library information, but I want to relate to the material in a different way. Back in the physical world, how do we view magazines in a newsagents? Are magazines hidden away or are the covers displayed to catch our interest and therefore purchase them? Some magazines like National Geographic are easily recognised by their iconic yellow and striking cover images. Likewise, the covers of the Women’s Weekly are an iconic historical record of Australian society. I can remember what the covers looked like from when I was growing up, but I can’t easily remember the dates of any of the issues. How can I access this information in a visual manner? With a bit of screen scraping I can build an alternative entry path into the collection. By extracting the relevant details for the year, month & issue I can repurpose the data into a visual timeline. 50 years worth of issues is a bit much to be loading all at once, so I’ve built this to dynamically load in another year of covers as you scroll to the bottom of the screen. I like this interactivity as it encourages exploration without being too resource intensive. Of course the covers link to the relevant issue within Trove where you can explore the content further. I hope this proves to be an interesting way of interacting with the collection. Enjoy. Update 24 Dec 2010: My timeline has been integrated into Trove. This entry was posted on Tuesday, November 30th, 2010 at 12:30 pm	and is filed under Blog, Interaction, Libraries, Museums. You can follow any responses to this entry through the RSS 2.0 feed. Both comments and pings are currently closed. I just got sucked in to signing up and doing my first text correction. 😉 The interface is REALLY good. well done NLA. Brilliant. Thanks for signing up. We always need text correctors.